A Turkish court has remanded in custody Amnesty International’s Kılıç Taner just hours after its local director was released by a different court along with eight activists. The Turkish state accuses the group and its US-based leader of being behind the July 206 coup attempt in which at least 250 people were killed and around 2,200 injured. Tens of thousands of people were jailed in the wake of the putsch. Amnesty International has welcomed the conditional release of eight activists in Turkey. A court in Istanbul released the group while they are tried on charges of belonging to and aiding terror groups. Three others are also on trial, but were not being held in custody. “Today, finally, we celebrate that our friends and colleagues can go back with their loved ones and can sleep in their own beds for the first time in almost four months”, said the organisation’s Secretary General, Salil Shetty. Amnesty’s director in Turkey, İdil Eser, is among the released defendants. “But any joy is tainted by the ongoing detention of Amnesty International’s chair, Taner Kılıç, whose separate trial is due to start”, Shetty added. 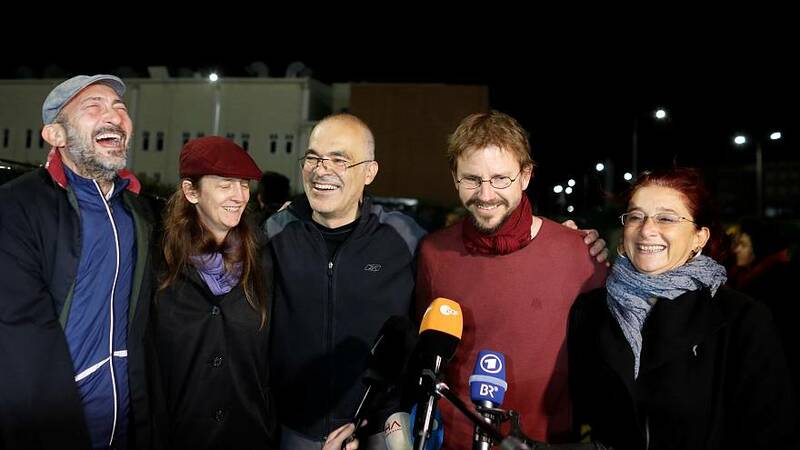 German Peter Steudtner and Swede Ali Gharavi were among those released. Neither one is required to remain in Turkey ahead of the next court date on November 22. However, four Turkish nationals implicated in the same case have reportedly been banned from travelling. Özlem Dalkıran, a member of the Turkish wing of the European rights organization Citizens’ Assembly, was among them. “I have no idea why we’re here”, she told the court. Steudtner demanded to be both released and acquitted. “Of the terror organisations that I’m accused of aiding in the indictment, I had only heard of two of them from the news before I came to Turkey […] None of the information in the indictment links me to any terror organization. I demand my release and acquittal,” he said in his defence. The eleven suspects were detained during a police raid as they attended a digital security training workshop in July. Before the next court date, the court is to hear testimony from the manager of the hotel where the gathering was held. The case has once again raised fears that Turkey is edging towards authoritarian rule. “These politically motivated prosecutions are an attempt to silence critical voices within Turkey but have only served to highlight the importance of human rights and those who dedicate their lives to defending them”, said Shetty.